Make your event unforgettable. Get your group and clients “into the act” with magical Fun and Games. Enter the humorous world of Johnny Moon Magic. Johnny is an event planner’s dream. He can customize his performances to meet your theme. for you at your event! Here are some of the venues Johnny has worked. His experience in the realm of ideas like these will make your upcoming event a smash success. Johnny’s dinner show is usually around 40 minutes long with lots of laughs and amazing magic that takes you by surprise. Special effects are performed with designated guests and dignitaries to the delight of the entire audience. On many occasions Johnny is asked to perform close up magic at the tables prior to the after dinner show. Johnny will custom design or routine a magic show to fit your event. It may be the introduction of a new product to the world or an opening of a new building or location for your enterprise. Johnny attracts attention and holds interest. He has been the responsible point person at many, many trade shows. He knows when to move future clients into the booth to get an in-depth product introduction and facilitate a sale. Customized magic that pitches a particular product is always a part of Johnny’s presentations. Johnny is a private party expert with 35 years and 1000’s of shows for movie stars, top executives and people in all walks of life. There are two formats Johnny works in. One is close up and personal sleight- of-hand; here, the magic happens in the viewer’s hands. 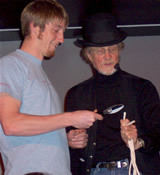 The other format is a stand up performance with special volunteers that involve the entire audience in personal illusion. In both formats there is the promise of one laugh after another. Johnny brings years of engineering, sales management and magic skills to pull everyone together with team magic routines tailored to the project. The team that can laugh together can better work together. Meetings can be dull, so spice it up, make it lively and surprise your staff. Johnny’s material can be tailored to get special points across. 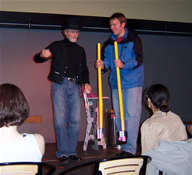 For Picnics & Pool Parties, Johnny offers magic that both adults and children love and admire…comedy magic material that has been tested under these conditions in hundreds of performances. street magic like you’ve never seen before. THEMED MAGIC EVENTS - “A character for any theme you can dream"